At White Mountain Biodiesel, LLC we believe that the age of oil is rapidly coming to an end. The World Fact Book, a reference resource authored by the CIA, indicates there is 1.4 trillion barrels of oil left on the planet. This sounds like a big number, but the World consumes 85 million barrels of oil a day, or 31 billion barrels a year. Therefore, at our current consumption rate, it will all be gone in 45 years. And the fighting over these reserves has already begun. Our nation's wealth is being exhausted buying and protecting petroleum. Our sons and daughters are dying to secure our access to oil. Help us to protect our children and the economic future of America. 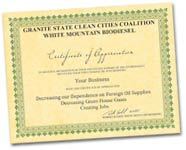 Ask for and use products made with biodiesel. For more information regarding each of these activities or other information regarding the company please click on one of the links provided.